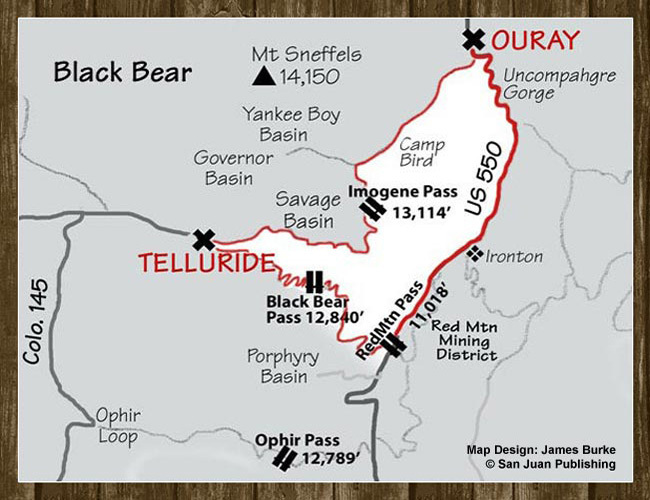 Black Bear Pass is considered one of Colorado’s most memorable and rugged Jeep tours, connecting Ouray to Telluride. In 1975, country singer C.W. McCall wrote about Black Bear Pass with the words “You don’t have to be crazy to drive this trail, but it sure helps!” With staggering descents and spectacular views of both Bridal Veil Falls, Telluride, Lizard Head, Wilson Mesa and many other San Juan Mountain peaks, mountain explorers are afforded a trip of a lifetime. And, because we just can’t stop there, we’ll return to Ouray over Imogene, one of the highest driveable 4×4 passes in the country! This full day Jeep itinerary should be on the ‘must-do’ list for anyone with an adventurous heart who wishes to experience San Juan mountain jeeping at it’s most exhilarating! Depart from Ouray, Colorado. Travel through the historic Ironton and Red Mountain mining districts to the top of Red Mountain Pass. From this point, begin your 4×4 journey as you trek up Black Bear Pass with a stop just past the 12,840 ft summit to soak in the views of the surrounding Red Mountains, carpets of mountain aster, alpine streams and artic ponds dotting the landscape. Heading down, enjoy the bird’s eye view of Ingram Basin and Town of Telluride. Then, hold on to your seats as you slowly make your way down a narrow precipice to the renowned, heart-pounding stair steps and switchbacks over Bridal Veil Falls and Telluride. Return to Ouray via Imogene Pass and discover the expansive ruins of the Tomboy and Camp Bird Mines left behind in the rocky terrain of the area. Both mines are littered with remnants of century old mining structures sorely tested by avalanches, heavy snow and even fires prevalent in the San Juan Mountains. Rugged, exciting adventure in specially-built Black Bear Pass Jeep Wranglers. This personalized adventure is designed for 4- 5 guests but does require a minimum of 3 to operate. However, groups of 6 – 8 may also be accommodated in an alternate tour vehicle, or multiple vehicles. Not recommended for children under 6. Please inquire. Generally available from 7/10 – 9/15. Approx 9 hours. Full Day: $159.00 per adult / $89.00 per child 6-12. Jeep Forum. Photos from Black Bear Pass going into Telluride.